At Flanagan Motors Mazda, you can count on us for carrying the latest exciting models of new Mazda vehicles, offered at great prices. One model we are especially excited to have at our Missoula Mazda dealership is the 2019 Mazda CX-9, a spacious third-row SUV that delivers a comfortable driving experience while mastering harsh driving conditions and captivates the eye with its brilliant interior and exterior design. You can experience the 2019 Mazda CX-9 in person by visiting our Mazda dealership near Helena, MT. This sleek three-row SUV offers generous room for up to eight passengers total while also allotting plenty of space for cargo. The exterior design continues Mazda’s trend of looking forward, with its aerodynamic body shape and elegant lines on display. The interior shows off superior craftsmanship with the use of high-quality materials and a layout that immerses each passenger in comfort for any length of journey. The Mazda CX-9 is available with i-ACTIV® all-wheel drive, offering incredible handling in rapidly changing driving conditions, allowing you to be ready for adventure at a moment’s notice. There are four trim levels of the Mazda CX-9, each offering new elements of convenience and luxury. Each trim level comes with a 2.5L 4-cylinder turbocharged engine, which produces 250 hp and 310 lb-ft of torque, allowing for a towing capacity of up to 3,500 lbs. 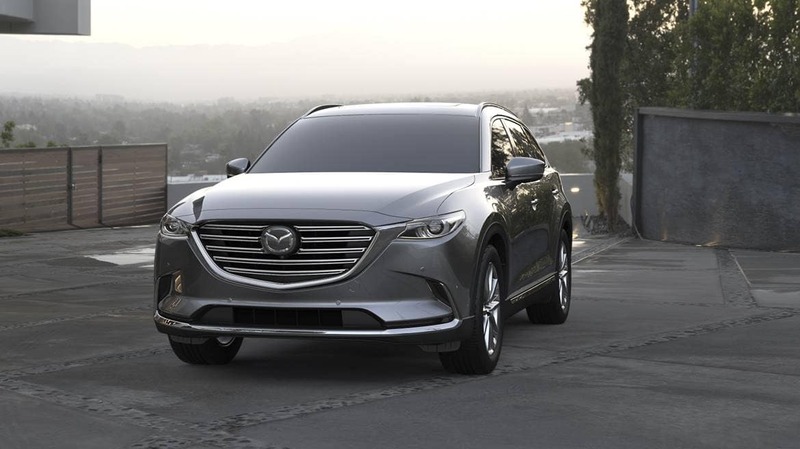 Overall, the Mazda CX-9 features a suspension and body frame that both help to create a smooth driving experience. When you drive off from our Mazda dealership near Helena in the Mazda CX-9, you can take on the road with confidence thanks to its advanced safety technology. The available i-ACTIVSENSE® safety suite equips the Mazda CX-9 with features that help make the occasional lapse in attention or judgment more forgiving. One such feature is the Smart Brake Support with Collision Warning, which warns of potential accidents and can even apply emergency braking if necessary. A brilliant touchscreen infotainment system comes standard on the Mazda CX-9 and prominently stands out on the dashboard for convenient visibility. Available Android Auto and Apple CarPlay both help you stay connected to your favorite media and useful information. Buying a 2019 Mazda CX-9When you visit our Missoula, MT Mazda dealership, located at 1776 Stephens Ave, you will be met with a warm welcome and incredible customer service. Our wonderful staff will be happy to walk you through the buying process, including financing a new Mazda car, selecting your trim, and setting up a test drive. We hope to see you at our lot soon.